We Identify the Underlying Issue & Correct it Naturally utilizing non-medical, med-free solutions. Getting Med Free Results where no one else can is what sets us apart. Aspen Brain Health Programs address brain-related issues in children, teens, adults and seniors. More Questions? How does it work? Why spend $4,000 at a Dr Amen clinic (plus travel) to get his SPECT imaging brain test, when you can get almost the same thing through one of his certified coaches for a fraction of the cost? Same paperwork, same brain typing, same protocols, same if not better results with a brain coach trained in several methods, programs, and solutions. Aspen Brain Health is comparable to other great options running in the thousands of dollars without the expense and lengthy visits. We highly recommend programs like Brain Balance, SPECT Imaging at an Amen Clinic, and Neurofeedback, but recommend giving us a try first (or alongside)! 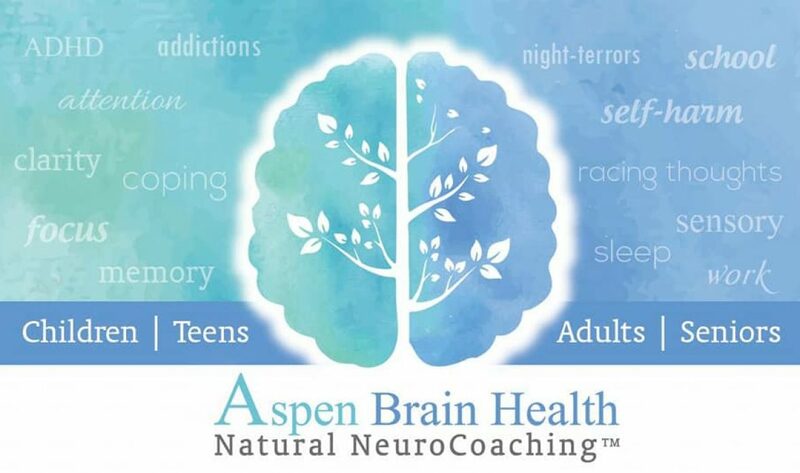 Aspen Brain Health uses cutting-edge research from all the latest experts to customize a coaching plan and goal for your unique brain type and symptoms. Aspen Morrow, CBHC, CPSS, is not a doctor, but a peer who has been through the trenches for herself, her family, and hundreds of clients. Her best-selling books have sold over 10,000 copies around the world. Just want to pick her brain? Book a 30 or 60 min consult that can be applied to the Dr Amen testing program should you decide to proceed. A free 15 min phone consult is available. She incorporates the best methods of her 15+ years of research into her ministry/coaching practice, including resources from: Dr Amen; Dr Kelly Brogan, Holistic Psychiatrist; Dr Carolyn Leaf, Christian Neuroscientist; Dr Natasha Campbell-McBride (GAPS™); Dr Axe; and everything regarding the gut/brain axis and micronutrient research for the brain.